A complete line of machinery is one of the largest investments that a farm business can make. Yet, unlike land or buildings, machinery must be constantly monitored, maintained, and eventually replaced. How and when equipment is replaced can mean a difference of thousands of dollars in annual production costs. Farm record summaries point out some of the differences between the more profitable and the less profitable farms in Iowa. The table below shows the wide range of machinery cost per acre and machinery investment per acre from a sample of Iowa farms. Costs related to the machinery line clearly had a large effect on whether farms were high profit producers. Many producers give less attention to machinery costs than other cost areas because the cash expenditures are made infrequently. And, once the investment is made, depreciation and interest (except on loans) become noncash costs, and are less visible. One of the difficulties in analyzing machinery costs is that they change over time. Depreciation tends to be great at first, especially for a machine purchased new, but declines over time. Likewise, interest expense is high initially but gradually diminishes. This is true whether the interest cost is cash interest paid on a loan, or an opportunity cost based on revenue foregone by continuing to own a machine year after year. On the other hand, repair costs may amount to little or nothing when a machine is still under warranty, but eventually increase as parts wear out and maintenance requirements rise. Fuel and lubrication costs usually do not change much over time, although an older engine may eventually lose some degree of fuel efficiency. 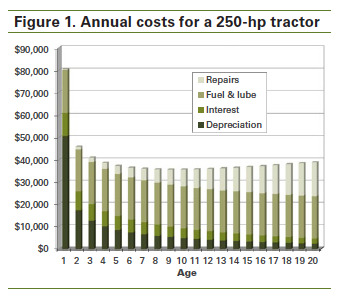 Figure 1 shows how these various costs are projected to change over time, using a 250 horse­power tractor purchased new for $200,000 as an example. Costs are calculated using methods approved by the American Society of Agricultural and Biological Engineers (ASABE). Total costs decline rapidly during the first few years, then rise gradually. The decision to replace an item of farm machinery can be made for several reasons. Cost minimization. The standard rule for minimizing the long-run cost of equipment is to make a change when the annualized total cost of owning and operating the machine begins to increase. In the example shown in Figure 1, this happens in about the ninth year of ownership. At this point repair costs begin to increase faster than depreciation and interest costs decrease. However, the rate at which total costs rise is often very gradual. In this case, the total cost in year nine is estimated to be $35,706 while the cost by the time the tractor is 15 years old is only $36,896. Thus, while the rule of increasing total cost can give a general picture of when to replace a particular machine, it cannot give a precise answer. Note that the estimates for repair costs project them to increase gradually over time. In reality, though, repair costs tend to be quite variable from year to year, ranging from only routine maintenance items to a complete overhaul. Being able to anticipate when large repair costs will be needed is a key consideration in deciding when to replace a machine. Reliability. Besides the standard machinery costs, most operators also consider timeliness costs in their replacement decisions. Timeliness costs occur when crops are not planted or harvested at the optimal time. They can be attributed to losses in yield, such as when corn or soybeans are planted too late to enjoy a full growing season, or a loss of quality, such as when hay or silage is not harvested at its peak nutritional value. If a machine breaks down at a critical time, timeliness costs can be quite high. Timeliness costs are very hard to measure, however, and their importance depends on the weather in any given year. Nevertheless, they should not be ignored, especially in climates where the optimal planting or harvesting period is rather short, and for crops that are particularly sensitive to the effects of weather. Owning machinery that has a high probability of breaking down increases the risk of crop losses. Pride of ownership. Many farmers take pride in owning and operating new, modern machinery. They may be willing to accept higher long-run costs in return. If the farm business is financially able to bear this cost, there is nothing wrong with “new paint.” However, the operators should have a clear idea of how their own machinery costs compare with those of other operations and the scope of their opportunity cost from not having capital invested in other assets. New technology. In some cases a machine may be in perfectly good working order, but the introduction of new technology has made it obsolete. Newer models may do a better job of harvesting or planting, or operate more efficiently. Care should be taken to distinguish new technology that can increase profits from changes that simply provide more convenience and comfort. Need for capacity. When the number of acres of crops being produced increases significantly, operators may need to replace machinery with models that have higher capacity to complete planting and harvesting without serious timeliness losses. Likewise, when farm size is reduced, it may be possible to cut costs by downsizing the machinery set. The farm machinery market. The market for farm machinery is subject to changes in supply and demand, just as for any other product. In particular, the demand for both new and used machinery is strongly affected by ups and downs in the farm economy. The operator who maintains a good capital reserve or borrowing capacity may be able to reduce long-run ownership costs by replacing machinery when dealers have excess inventory and are willing to offer deep discounts to make a sale. When the farm economy is below average, there may be bargains available in used machinery. There are at least four general strategies that farmers can follow for replacing machinery. Replace frequently. This approach minimizes the risk of breakdowns and costly repairs by trading key machinery items every few years. Even when repairs occur, they often will be covered by the original warranty. Operators who cover a large number of acres each year and would be severely inconvenienced by extended down time are most likely to follow this strategy. Although this is probably a more expensive approach over the long run, some of the extra costs are offset by fewer timeliness losses, the ability to farm more acres, and less need to invest in repair and maintenance tools and facilities. Operators who trade machinery frequently may find that leasing or rollover ownership plans are more feasible for them than conventional purchase plans. These options are discussed later. Replace something every year. A second approach is to try to replace one or two pieces of machinery every year. The goal is to spend about the same amount on new equipment each year. This avoids having to make a very large cash outlay in any one year. However, it also could result in replacing machinery before it is really necessary. This strategy often is used by operators who prefer to finance machinery purchases out of their annual cash flow rather than with borrowed money. It works best when the net cash income of the operation is fairly constant from year to year or when significant cash reserves are available. Replace when cash is available. A third approach is to postpone major machinery purchases until a year when cash income is higher than average. This keeps the machinery purchase from cutting into funds needed for other purposes such as family living and debt servicing. It also helps to level out income for income tax purposes, although rapid depreciation methods and the ability to use income averaging have made this less of a consideration than in previous years. The biggest disadvantage of this strategy is that it is very hard to predict when extra cash will be available. Furthermore, a machine may become seriously unreliable before the business has sufficient funds to replace it. Keep it forever. Finally, some operators simply hang on to machinery until it reaches the point where it can no longer perform its intended function and is not worth renovating. This may be the least cost approach in the long run, but it runs the risk of a machine failing at a crucial time, or having to arrange financing on short notice. The operator also must be willing to use less than the latest technology. 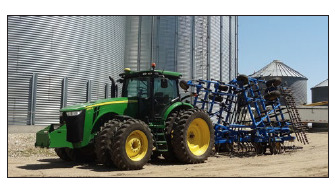 Some older items can be relegated to less critical uses, such as keeping a second planter for a backup unit, or using an older tractor for jobs such as powering an auger or moving wagons. This strategy works best for operators who have considerable flexibility in when they complete key field operations, and who have the skill, patience and facilities to do their own repair and maintenance work. Most farm equipment is still acquired under a conventional purchase plan. The capital may come from the purchaser’s own funds, a third party lender, or a company financing plan. More and more major machinery items are being leased, however. Most are acquired with an operating lease, in which a fixed annual or semi-annual payment is made for several years, after which the machine can be returned to the dealer or leasing company or purchased for a predetermined price. The lease payments are tax deductible as ordinary operating expenses. A finance lease is similar to an operating lease, but the operator is considered to be the owner of the machine, and is entitled to take depreciation deductions. The operator still can choose to keep the machine at the end of the lease period or return it. The final buyout price can be quite variable. In effect, the finance lease is equivalent to a conditional sales contract with a balloon payment at the end. Another option is the rollover purchase plan, in which the operator purchases a new or nearly new piece of equipment from a dealer with the expectation that it will be exchanged for another model after one year or season. Often the purchase is financed with a company loan that accrues no interest until the date to trade. At that point a cash payment is made, sometimes based on the hours of use accumulated on the model being returned. Both lease and rollover purchase plans minimize the direct cash outflows needed to acquire the use of a machine. The rollover plan also guarantees that the machine will be relatively new and have little or no repair cost. For this same reason, it is usually the most expensive plan. For both a lease and a rollover, the operator will have built up no equity interest in the equipment. Table 2 compares the cash outlays for an outright purchase, a 5-year operating lease, and a yearly rollover purchase for a $300,000 combine. The lease payments are assumed to be $45,000 each year, and the cost to trade under the rollover plan is $40,000, plus interest of $4,800 on the original loan each year. Estimated repair costs are assumed to be under warranty for all years in the rollover plan, but only in year one for the purchase and lease plans. The cash payments are shown as positive values. For the purchase plan the salvage value of the combine is shown as a negative outflow (i.e., a cash inflow) in year five. 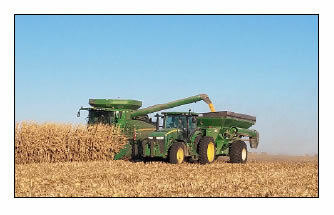 For the rollover plan, the original loan of $240,000 would have to be repaid in the year following the fifth season, minus the remaining value of the last combine returned. Decision Tool A3-21-35, Farm Machinery Financing Analyzer, can be used to compare alternative financing plans, with or without income tax effects. While saving taxes should never be the sole reason for purchasing machinery, income tax effects do need to be taken into account. Figure 2 shows the estimated total annual cost of the tractor in Figure 1 after subtracting income tax savings. The In­ternal Revenue Service (IRS) allows fuel, repairs, interest on a loan, and operating lease payments to be deducted as ordinary expenses. In addition, depreciation expenses can be claimed according to IRS guidelines. Note that in Figure 2 the net after-tax costs begin to rise after year 8, when the tractor has been fully depreciated. Depreciation. Generally speaking, it is advantageous to depreciate a machinery item as rapidly as possible. This is due to the time value of money; that is, it is better to save taxes today and have the use of the funds longer, even if the total savings are the same in the long run. Recent low interest rates have made this less important, however. Farm machinery falls into the 5-year class life Modified Accelerated Cost Recovery System (MACRS) depreciation category. Because the IRS allows only a partial year of depreciation to be claimed in the first and last year, it actually takes six tax years to fully depreciate the item. Table 3 shows the annual depreciation rates allowed for 5-year regular MACRS schedules. Section 179 Expensing. Farm machinery also is eligible for Section 179 expensing, sometimes called "expense method depreciation." A certain amount of the purchase cost of depreciable assets can be deducted in the year of purchase. The remainder of the purchase cost can be depreciated according to the normal MACRS schedule. The Section 179 limit is set by Congress. The benefit is phased out for the purchase of more than a maximum value of eligible assets in the same tax year. Check IRS publications for the current limits. Bonus Depreciation. Any of the beginning tax basis for machinery after Section 179 deductions have been taken is eligible for “bonus” depreciation in the tax year in which it is placed in service. Until 2023, 100 percent of the remaining basis is eligible. Any basis left after Section 179 and bonus depreciation can be depreciated by MACRS. Example. Table 4 shows the same comparison of cash outflows for three machinery acquisition plans that were shown earlier, with the addition of income tax effects. MACRS depreciation, interest, and repairs are included as tax deductions, and recaptured depreciation at the end of the five years creates additional tax to pay in year six under the purchase plan. Tax effects are assumed to affect cash flow in the year after they are reported. A marginal tax rate of 43 percent was used. The annual cost is the true cost of each plan over six years, taking into account the time value of money. Final quarter limitation. If more than 40 percent of the total depreciable property acquired by a farm business in a given tax year is placed in service during the final three months, a special “mid-quarter convention” must be followed. This adjustment results in more depreciation for items placed in service in the first two quarters, but less for items placed in service in the last two quarters. Generally, more than 40 percent of the total value of assets acquired in the tax year would have to fall in the first quarter in order to offset the depreciation lost on the items acquired in the last quarter. Thus, if major purchases of machinery or other depreciable assets are contemplated for late in the tax year, careful planning should be done before the final quarter begins. Now, suppose the tractor was purchased in October. Since the tractor purchase was more than 40 percent of the total for the year, the fourth quarter convention is invoked. The field cultivator is depreciated for two and one-half quarters (62.5%) and the tractor is depreciated for one-half quarter (12.5%). First-year depreciation is almost $3,000 less in the second case. The final quarter limitation does not affect the amount of Section 179 expensing that can be taken, and the 40 percent test is applied after any Section 179 expensing has been deducted. Most operators replace major machinery items by trading them in to a dealer in exchange for a newer model. The cash difference paid to trade, sometimes called the "boot," depends on the trade-in value of the old machine, the list price of the new machine, and the size of the discount the dealer is willing to give. When a replacement machine is obtained by private purchase, or when the dealer does not want the trade-in item, the old machine may have to be disposed of by private sale. Of course, to sell and buy is always an option even when a trade is possible. Generally, the choice will depend on which method requires the fewest dollars. In addition, most operators find trading in an old machine to be more convenient than selling it outright. The 2018 tax reform act eliminated "like- kind exchanges" for non-real property such as machinery. Now, when a machinery item is traded, the newly acquired item has a basis equal to its fair market value, and the traded item is considered to have been sold for an amount equal to the basis of the new item minus any cash boot paid to trade. If the old machine is sold for more than its final tax basis, a gain is created. Usually, this is reported as recaptured depreciation and taxed as ordinary income. However, revenue in excess of the initial tax basis of the machine is taxed as capital gain. Neither of these is subject to self-employment (SE) tax. If the machine is sold for less than its final tax basis, a capital loss is created, which can be used to offset capital gains from the sale of other assets. Take for example a new pickup purchased for $40,000. After three years the owner has claimed depreciation of $23,400, leaving an adjusted tax basis of $16,600. She then sells the pickup for $25,000, which is $8,400 more than its tax basis. She would have to report that amount as recaptured depreciation on her next tax return. If she had sold the pickup for only $15,000, which is $1,600 below its tax basis, she would have a capital loss equal to that amount to report. At the other extreme, if she had sold it for $45,000, she would have a capital gain of $5,000 to report, in addition to recapturing all the depreciation taken of $23,400. Figure 3 shows how the income tax basis for the example tractor used in Figure 1 would compare with its estimated remaining market value, using the ASABE equations and 5-year MACRS depreciation. No Section 179 expensing or bonus depreciation was taken. As shown, after the first year a sale most likely will result in a recapture of depreciation, unless the machine is sold for considerably less than average market value. Replacing farm machinery is an important and complex decision. Each farming operation must identify its most important reasons for replacing machinery, and then establish a consistent pattern. Reliability, long-run costs, pride of ownership, obsolescence, need for capacity, and tax savings should all be considered before making a final decision. A decision tool is available on the Ag Decision Maker website to compare the cost the cost of owning vs. leasing farm machinery. For more complete information on machinery management, see the following publications available from ISU Extension and Outreach.